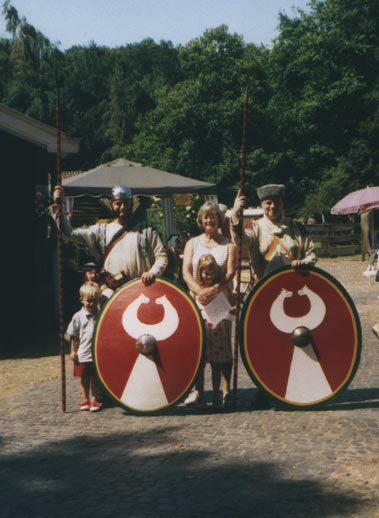 We were invited by Gelders Erfgoed to do a little show on a sunday at a small museum, Museum Freriks near Winterswijk. With temperatures as high as 31 degrees, it was very nice to have all the trees around, so we spent a very nice afternoon with a very friendly crowd. There were two (semi)professional storytellers around, and our little 'show 'n tell' fitted very well into their act. 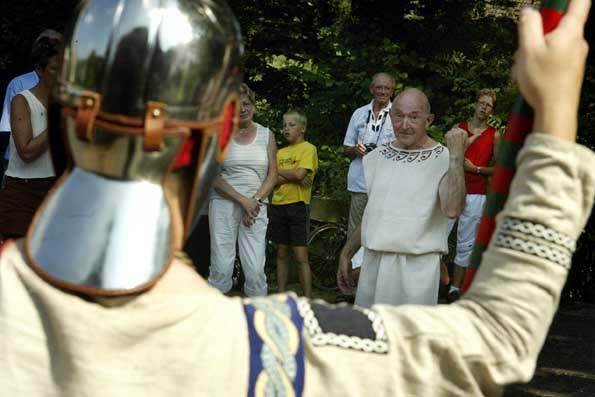 Henk Waaijenberg told the crowd about his days in the Roman army and his 'retirement', and we completed the story about the Late Roman army. All in all, a good day. Too bad for the pictures, my camera decided to refuse service.. Just two remain, one from a journalist and the other from my dad, showing me and Andreas, my kids and my mom. Looking across my back at the Roman stroryteller.